If your system is throwing SYSTEM_SERVICE_EXCEPTION blue screen of death error then you are not alone. Because there are lots of Windows users are currently suffering from this error. There are several reasons that can trigger this type of BSOD error, once your system starts throwing this BSoD error from that time you will become unable to access the PC/Laptop properly. 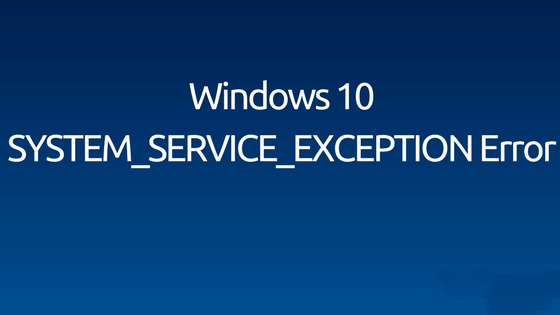 The system_service_exception windows 10 error is a very irritating error that appears on a blue screen and that’s why it is known as a BSoD error. Just like the other blue screen errors, it may come into view frequently with an error message ‘Your PC ran into a problem and needs to restart. We are just collecting some error info, and then you can restart’. Before applying the fixes to get rid of the system_service_exception error, first, it is recommended to know more about the issue. Generally, this BSoD error arises due to system drivers issue especially graphics drivers like AMD or NVIDIA. Sometimes, unsuited or error full programs and updates may also trigger this BSOD issue. First reboot your system and when it restarts press Shift + F8 key to open the Legacy Advanced Boot options. After it, select option screen choose Troubleshoot. From the Troubleshoot Window choose Advanced options. Now from the Advanced options choose Startup/Automatic Repair. This automatic repair option will scan your system for any type of issues and fix them automatically. At last, restart your PC and check for the error. First, you need to visit the Microsoft Support link and download the Hotfix. Click on the Hotfix Download Available and install. After installing restart your PC. Open the run dialog box by pressing Windows Key + R after it, in the box type “devmgmt.msc” and press ENTER key to open Device Manager. Now you have to deal with those system drivers which has a yellow exclamation mark. Simply, follow the on-screen instructions to finish the driver updates. If you are still unable to fix the issue, then uninstall the driver and reboot your PC. After rebooting the system, all the drivers get installed automatically. You can also download and install the Intel Driver Update tool. After installing run this Driver Update tool and click on the Next. Accept the license agreement and click Install. After the completion of System, driver update click on the Launch. Next, click on the Start Scan and after the completion of driver scan process. Click on the Download. Click on the Install option to install the latest Intel drivers for your system. After the completion of driver installation process reboot your PC. It is recommended to apply this fix in the safe mode. Boot your PC/Laptop into Safe Mode. Now, navigate to the Control Panel > Programs > Programs and Features and click on View installed updates. After it, right click on the Security Update for Microsoft Windows (KB2778344) and Choose Uninstall to delete this update. Click YES in the Uninstall an update confirmation box. After removing this update completely, reboot your PC. After the completion of this fix, check for the issue. Yes, Google automatic update services can cause “system service exception”. So let’s see what happened after disabling Google Update Services. Open the run box by pressing Windows Key + R.
In the run box, type msconfig and press Enter key. Now, search and uncheck Google Update Service. Click on the Apply then OK.
Reboot your system and check for the error, it should be fixed. Open the Command Prompt with admin privilege. Right click on the Start Menu and choose Command Prompt (Admin). After opening the command prompt you need to run sfc Type sfc /scannow and hit Enter key. This will scan the system files and all the error gets fixed automatically. Western Digital Driver or any other External Hard Disk Driver. Nvidia or AMD graphic card software. After applying all the above-given fixes, you will see that the System Service Exception Error gets fixed and your system is working normally. Sometimes, after fixing this issue PC gets slow. In order to overcome slow system performance, it is suggested to scan your PC with a professional PC Booster Tool. This tool will scan your PC errors and fix all type of issues like BSoD errors, Driver issues, registry error, Slow PC performance and more. So it is suggested to scan your PC with this PC Error Repair tool once, and enjoy your PC/Laptop as a new.